"More than 400 kids remain separated from their parents. 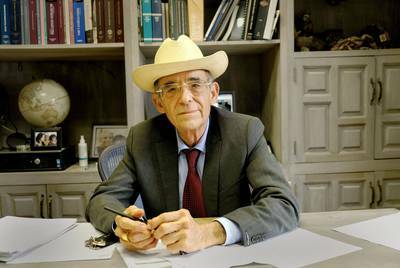 Here’s one lawyer's long shot plan to reunite a family" was first published by The Texas Tribune, a nonprofit, nonpartisan media organization that informs Texans — and engages with them — about public policy, politics, government and statewide issues. Despite a legal team that includes celebrity lawyer Michael Avenatti, an 8-year-old Guatemalan boy separated from his father under Donald Trump’s zero tolerance policy remains in a shelter in Baytown with no end in sight. Byron Xol Bol, who was detained with his father after crossing the Rio Grande into Texas in May, is one of 416 separated children who have yet to be reunited with their parents, as attorneys scramble to untangle the details of the cases and the government fails to meet court-ordered deadlines to reunify the children with their families. The Trump administration launched a "zero-tolerance" policy earlier this year that led to more than 2,500 children being separated from their families, including the Xols. President Trump walked back the policy in June after public outcry, and signed an executive order on June 20 that essentially reverted back to the prior "catch and release" policy that the president had criticized. Byron Xol is among more than 300 children whose parents have been deported, making reunification even more challenging. Avenatti’s co-counsel, Laredo attorney Ricardo de Anda, missed Byron's initial immigration court hearing on Sept. 4; as a result, an immigration judge pushed it back to Oct. 30. Now de Anda has embarked on a long-shot legal strategy of bringing the boy’s recently-deported father, David Xol, back to the United States and having him turn himself in at the border. Xol lives with his wife, Florinda, and their two other sons in San Miguel Limón, a mountain village in Guatemala more than 1,000 miles from Houston. De Anda said immigration officials deported the father without giving him time to litigate his asylum case. Rather than seeking to have Byron returned to Guatemala, de Anda said he plans to argue that the boy and his family face imminent danger in Guatemala because of gang threats that he says are religiously motivated. “I don’t believe it’s safe for the child to go back, so it’s not in his best interest to be deported," de Anda said. David Xol said in a phone interview he faces persecution from gang members because he is an Evangelical Christian and his religion prohibits him from engaging in illegal activity. He said church members are targeted by gangs because they preach to the youth not to join in the criminal activity, which angers the gangs. The federal government has made it more difficult for immigrants — particularly people from violence-torn Central American countries like Guatemala — to successfully claim asylum after Attorney General Jeff Sessions declared in June that domestic and gang violence were no longer valid grounds for claiming asylum in the United States. Immigration experts say de Anda's plan carries risks. Sarah Pierce, a policy analyst at the Migration Policy Institute, a Washington D.C. think tank, said it's likely that federal immigration officials will either quickly remove David Xol from the country again — without his son — or will decide that they're obligated to reunify him with his son under a federal class-action lawsuit overseen by U.S. District Judge Dana Sabraw. The American Civil Liberties Union filed the lawsuit after a woman from the Democratic Republic of Congo and her daughter were separated while seeking asylum in the U.S. The mother and daughter were reunited in March, but the judge continued the case after the zero tolerance policy began. De Anda said he believes David Xol's case should be added to the ongoing lawsuit, which claims the separations are unconstitutional. But Jodi Goodwin, an immigration attorney based in Harlingen, said relying on that lawsuit could be a gamble. Goodwin said in a case like this, the parent has already been separated from his son and deported, so his solo return to the U.S. border would likely not fall within the lawsuit's parameters. De Anda says he's confident the strategy will work. Once David Xol arrives at the border, de Anda said he'll ask the government to lift Xol's prior deportation order, then seek to get him a "credible fear" interview so he can state his reason for seeking asylum. De Anda downplayed his no-show at the Sept. 4 hearing, but acknowledged that nobody at his firm called the 800 number the court system uses to post hearing information. He said he’s focused on getting David Xol all the necessary paperwork to get out of rural Guatemala, travel safely through Mexico and get to a U.S. port of entry. De Anda said he plans to work with the Guatemalan consulate in Houston to safely bring Xol through Mexico by bus and then will meet him at the border. “What’s critical now is not to have a hearing, but to get David here as soon as possible because the faster David gets here and in the hands of the government, the faster we can get relief for Byron,” de Anda said. De Anda said after he agreed to take the case last month — four months after the Xols were separated — he joined forces with Avenatti as a strategic move to bring national attention to the family’s story. Avenatti had hired de Anda on a separate family separation case in August, which ended with a 9-year-old boy being returned to Guatemala after being separated from his mother for 81 days. De Anda said Avenatti has offered some legal counsel on Byron's case, but acknowledged he mostly works alone. Xol said he lost his job at a palm plantation and still owes the $8,000 he borrowed to pay the smuggler who helped him and Byron reach the U.S. border. When he speaks with Byron on the phone, he said his son asks when he will get to come home. Xol said de Anda's plan sounds like the only option forward. “I think that Byron will be happy because what he wants is for me to go back and for us to live together,” he said. Jay Root and Elsa Cavazos contributed to this report. Thousands of children still live in Texas shelters after end of "zero tolerance"
This article originally appeared in The Texas Tribune at https://www.texastribune.org/2018/09/12/texas-migrant-families-separated-zero-tolerance/.